An estate is the present or future degree, nature and extent of INTEREST that a person has in real property. An “estate” in real property bestows more rights than does a mere “interest” in real property. A person who has an estate in real property has the right to possess the property, whereas a person who only has an interest in property, such as an easement, has the right to use the property but not to possess or own it. Under English common law, there are two categories of estates; Freehold Estate and Nonfreehold Estates. This blog will address Freehold Estates. Any interest in real property that lasts for at least a lifetime is classified as a Freehold estate. These Freehold estates are either (THIS IS IMPORTANTà) ESTATES OF INHERITANCE or ESTATES NOT OF INHERITANCE. Fee Simple Estate is absolute ownership of real property; owner is entitled to the entire property with unconditional power of disposition during the owner’s life, and upon death the property descends to the owners designated heirs. Fee Simple Determinable is an inheritable fee estate that may terminate upon the happening of a stated event. The grantor conveys property to X “for so long as” some limiting event does or does not occur. Example: Smith deeds property to school district for “so long as” the school district maintains a public high school on the parcel. The former owner / grantor (Smith) still has an INTEREST to the property because if the public school ceases to operate, the property reverts back to Smith (or heirs). The grantor (Smith) interest in the real property is called a possibility of reverter. Estate for the Life of Another (“Pur Autre Vie”) is an estate one person grants to another, ONLY for the duration of the life of a third person. Example: Jones grants a life estate to Smith to use Jones’ land until Smith’s wife dies. Jones has a life estate pur autre vie. Conventional Life Estate is one created by an express transfer of land “To X for life,” granting X ownership for the duration of X’s own life. Upon the death of X, title to the property will pass in fee to the person or entity named in the instrument creating the life estate, or if no one is named, to the grantor or their heirs. Marital Life Estate is a life estate arising by operation by law where a married person owning an inheritable estate dies and is survived by his or her spouse who, under certain conditions, could have a life estate in part or all of a deceased spouse’s real property owned at any time during the marriage. To learn more about Estates in Real Property, and the thirteen (13) Real Property Ownership / Interest questions you WILL see on the National section of the NC Real Estate Broker License Examination, – join your colleagues at one of our many live class offerings. Like us on Facebook for additional critical content learning and NC broker license examination support. 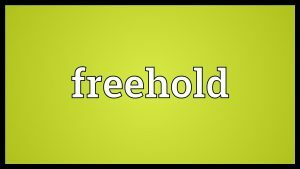 Freehold Estates – –> IMPORTANT: Know which estates are of inheritance and not of inheritance!